For the longest time I’ve had my single article on the best pillows available here in the UK but it’s time I delve a little deeper. So today I’m going to share everything I know about buying a memory foam pillow. I love Memory foam pillows because work great at keeping your head supported letting you sleep soundly all night plus they help stop neck pain. An ideal choice for side or back sleepers but not for people who tend to get hot flashes through the night. I’ll get into more detail down below and then you can read my reviews of the top memory foam pillows available in the UK. Check out the box below for a quick run down of the best memory foam pillows, just click the name and you’ll be taken to their website where you can get some more info and buy yours. I love a memory foam pillow, to me they can do no wrong, but that’s because I’m the ideal candidate to sleep on one. Because they do have their downsides of course, to me they’re far outweighed by the upsides but I’ll share the pros and cons so you can decide for yourself. Excellent Neck Support – If you suffer from neck pain memory foam can be an excellent choice because it moulds to the shape of your head allowing your head to sink in while your neck still gets the support it needs. Ideal if you tend to wake up with a sore neck in the morning. Suitable For Back and Side sleepers – front sleepers will struggle on memory foam but if you’re a side or a back sleeper then you’ll sleep soundly with a memory foam pillow. Long Lasting – Memory foam pillows have some of the longest life of any type of pillow (provided you get a good one) with some having a guarantee of up to 10 years! Compare that to other types which will only last you 1-3 years that’s real value for money. Quiet – Some pillows make a lot of rustling sounds when you move about, I know I’ve been woken up through the night with the sound my pillow makes when I roll over so if you’re a light sleeper then memory foam is right for you. Hypoallergenic – Memory foam is naturally antibacterial and hypoallergenic meaning it keeps dust mites out and protects the skin which is very important since your face can be touching it all night long. They Can Get Hot – Memory foam can trap in the heat so if you’re prone to overheating or nightsweats then it’s not going to be for you. They Can Smell at First – there is always a distinct smell when you first open up a memory foam pillow, a sort of chemical smell that isn’t very pleasant. But it’s normal. If you leave it uncovered for about 24-48 hours the smell disappears. It may come out when you lay your head from time to time but it does disappear over time. They’re not good for everyone but they could well be right for you, if you fit into any of the categories below then there’s a good chance it’s going to be right for you. People who sleep on their side will find memory foam really comfortable keeping the neck aligned and not holding the head too high. People who sleep on their backs will also get on well having a cradled head that doesn’t tuck their head into their chin. 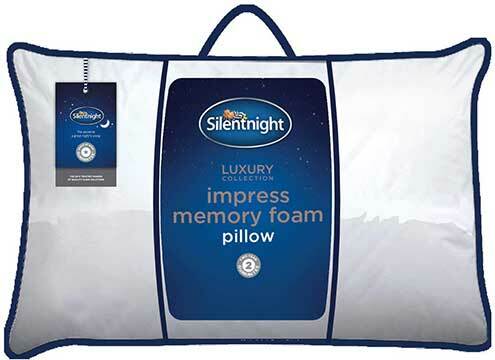 People who like a firmer pillow will also love memory foam, it’s usually a medium firm to firm feel. People who won’t like memory foam however are the ones who sleep on their front because memory foam tends to be a little too high off the bed to be really comfortable and can be a little suffocating to lie on as a front sleeper. Also people who overheat are better off giving memory foam a miss and going for something more natural. These are the two main types of memory foam pillow. Single Piece – This is a single block of memory foam, it offers the most support, is the longest lasting and is the most common type of memory foam pillow you can find. Shredded Memory foam – is lots of small pieces of memory foam that are packed inside, you get a lot more movement and also a lot of breathability from a shredded memory foam pillow compared to a single piece but they can get bunched up and become uncomfortable after prolonged use. Price – Memory foam pillows tend to be more expensive than feather or other fibres but they also last the longest making them the best value. Here we are at the main event! All the pillows here are available online and linked to UK retailers so you can order yours today. 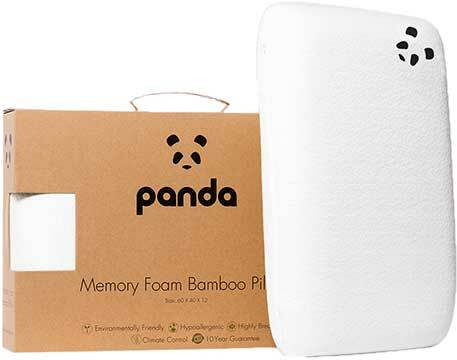 I love the Panda pillow, it’s made with an eco-friendly bamboo cover that makes it luxuriously soft as well as temperature controlled because bamboo is breathable helping counteract memory foam heat-trapping qualities. It’s made as a single piece with three layers of memory foam gel made using the latest technology which allows the pillow to breathe keeping it cool and helping it last longer. 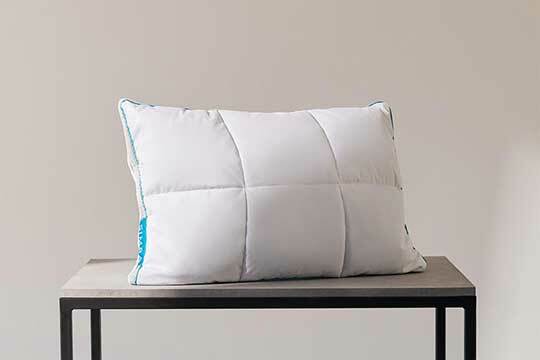 Perfect for side and back sleepers and anyone who was worried about overheating with their pillow. It’s got free delivery in the UK and you can test it out for 30 nights before you have to fully commit to it. Plus a 10-year guarantee so you know it’s built to last. Great value for money and easily the best memory foam pillow available. 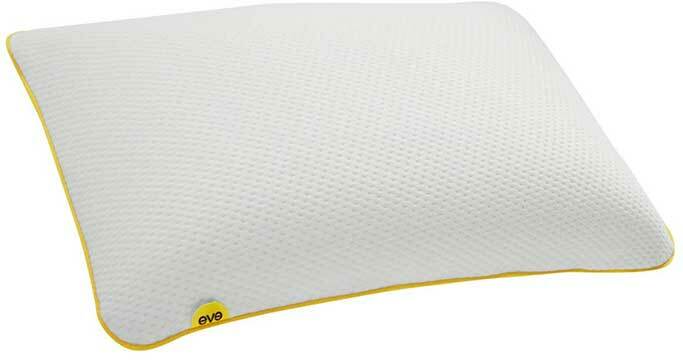 The eve pillow is another fantastic pillow that has addressed the overheating problem, they’ve done it by drilling little air holes into the single piece of memory foam making it more breathable and less hot. It’s a little firmer at a medium-firm feel so better if you’re sleeping on your side than you’re back but definitely not uncomfortable if you’re on your back. The jersey cover is also nice and breathable and you can put it in the washing machine making it great as an undercover under your regular pillowcase. This is an amazing pillow but holy crap is it expensive, at £95 it’s double the price of most of the other pillows on the list but has some really cool features in it. For instance, the memory foam section is made from little foam tubes that you can take out or put in to adjust the height as you see fit. Plus it’s a combo of memory foam, feather and microfibre making it really versatile and comfortable. A lot fluffier than a memory foam pillow for the familiar sink into the pillow feeling but with enough memory foam to give you support where you need it. That also helps keep your temperature more regulate so you can get the memory foam support without the night sweats. Silentnight have been making bedding for a long ol time, I’m talking over 70 years of experience so you know you’re going to get a damn fine pillow from them. 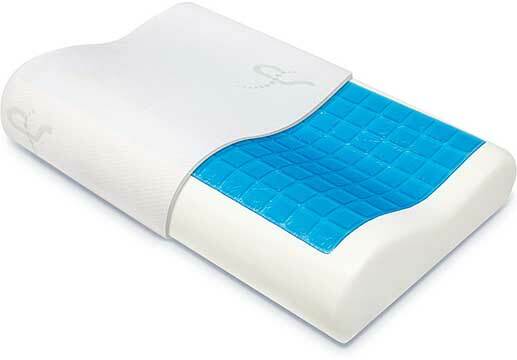 The impress is an affordable memory foam pillow that can get a bit hot but provides excellent support and comfort. The cover is a soft velour which is both comfortable and washable so you can take care of it really easily. If firm and affordable is what you’re looking for then the impress is the way to go. Contour pillows are an obvious choice if you’re prone to morning neck pain or even headaches, they’re shaped to give you the best possible support along your neck if you’re on your back or your side. Your head gets cradled while the lip pushes into your neck allowing it to fully relax and leaving you sleeping comfortably. There’s also a gel layer to this pillow which stops you getting too hot and the single piece means you don’t have to flip it at any point, you can just leave it as is and fall asleep happy. I also don’t know if it’s of interest to you but if you buy this pillow on Amazon you get a free eBook with it worth £19 on back health. Not overly relevant but a fun little extra none the less. And there you have it, I hope you’ve seen a memory foam pillow you’ve liked the look of, just click the Price and Reviews button and you’ll be taken to the retailers’ website so you can order yours.